Welcome to Found Around Town, where we feature cars we find in a city largely devoid of interesting ones because everyone drives Priuses or rides bicycles: Austin, Texas. This feature may sound familiar to you. Today we look at an Alfa Romeo Spider Quadrifoglio. 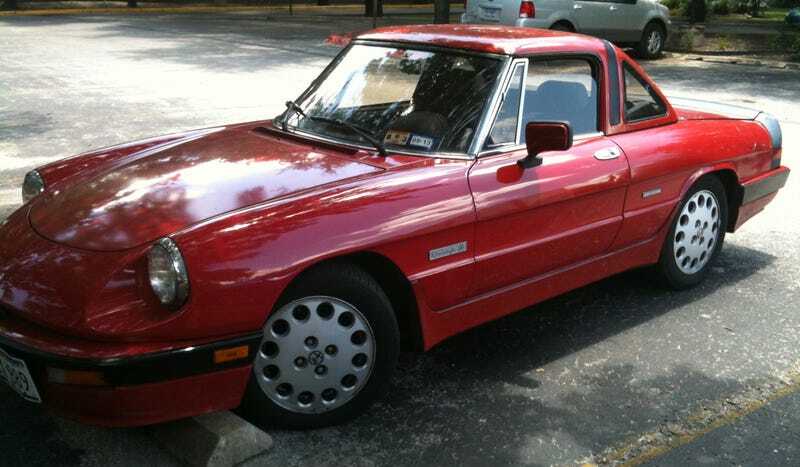 It's funny I should find one of these just a week after we wrote about them in our feature on Pininfarina designs. Initially, it can be hard to place a Spider's age since they were made for close to 30 years. But the badges tell us this red model is a "Quadrifoglio" edition, which is Italian for four-leaf clover. The Quadrifoglio came with a number of aesthetic add-ons like side skirts, 15-inch wheels, and a factory removable hardtop. It was first unveiled in 1985 and continued on to 1989, so this particular Spider isn't all that old. It has a 2.0-liter straight four with 130 horsepower. Although I don't feel like it really fits with the design of the rest of the car, I'm not surprised to see a Spider with a hardtop. I'd say I see more Miatas, S2000s and other roadsters here in Texas with hardtops — removable and retractable — than soft tops. It seems to be especially so if that's the owner's sole car. It makes sense. Nine months out of the year down here, unless you're going swimming, the sun is not your friend.